Just Before Dusk Sketch – Let's Paint Nature! How lucky am I to witness such beauty? I’m sure some lottery winners are not as happy as I (You know, they sometimes lose everything they get in a few years!). But nature can never be taken away or lost. Just look what I have! Real happiness, I stole a moment in time and captured it with pigments, to be enjoyed forever. This is a quick sketch of what it looked like the other night just before dusk. A heavy solid cloud, like a blanket, stretched out across the never ending sky only allowing a bit of sunset to shine through. How happy the trees were to be silhouettes of this magnificent scene…they told me so. d= date, t= time, c= weather conditions, and a= area of location. I love your tree silhouettes…I am noticing them every day now as I walk in the afternoons. Thanks for the beautiful image and inspiration. 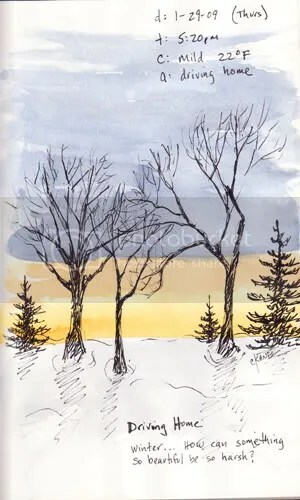 What a lovely sketch of a winter scene! The evergreen is especially nice. Barb: You have some great everyday walks too! i enjoy reading them, they are all so different, informative and interesting! Joan: thank you! Sketching is so much fun because it doesn’t require a whole lot of time or dedication!